Located in a quiet semi-rural setting on a 1/3 acre in the Mansfield township, this charming 2 storey self contained home accommodates up to 12 guests. It is ideal accommodation for families and groups of friends, set in a very peaceful location with tranquil private front and rear gardens with plenty of room for everyone both inside and out. Treat yourself and indulge in a stay at Mansfield House and enjoy everything the adventurous High Country has to offer. 4 large bedrooms, 2 with Queen beds and a single bed, 1 with twin single beds, 1 with 3 single beds and 2 trundle beds. Large open plan lounge / dining room with wood heater and reverse cycle heating a/c adjoining a country style kitchen with dishwasher and microwave oven, all looking out to a tranquil front garden. Great undercover outdoor entertainment area with gas BBQ, 8 seater table & chairs and relaxing lounge chairs all overlooking large private rear garden. "Our stay at Mansfield House was amazing. Lovely quiet setting with beautiful views. The house was beautiful and it felt like a home away from home. Our party of 8 all felt the same, we will definitely be coming back." * Entire house for your private use only. 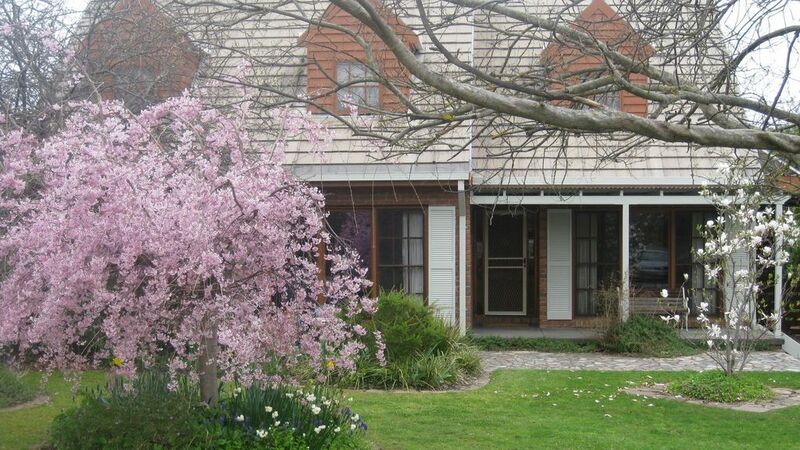 * Great views from all upstairs bedrooms (views to Mt Buller). * Comfortably sleeps up to 12 guests. * Four Bedrooms, two bathrooms, large lounge/dining room. * Two Queen beds, six single beds, 2 trundle beds. * Queen bedroom with ensuite down stairs. * Large queen bedroom also with a single bed and 5 single beds in two rooms with 2 trundle beds upstairs. * Quality bed linen and towels supplied. * Large outdoor undercover entertainment area with gas BBQ and outdoor furniture. * Tranquil private front and rear gardens. * Fully equipped country style kitchen with dishwasher, microwave oven & basic essentials supplied (tea, coffee, etc). * Spacious open lounge/dining room with wood-fire heater, reverse cycle heater a/c, 40" LCD HD TV, DVD, Video & CD players. * Selection of 50 plus in-house movies. * Electric blankets and ceiling fans in all bedrooms. * 2 Porta-cots & high chairs available for use. * Note: Strictly no pets allowed. This is a non-smoking residence. "We were really impressed with the house the moment we turned into the driveway. There was even more room than we expected, and everything was spotless and perfect. It is a fabulous house and the gardens are beautiful. We really enjoyed sitting on the back deck soaking up the fresh air and country sounds. we will be back, but next time for a longer stay. Thank you so much." * Affordable rates for families and groups. * Minimum two night stay on weekends. * Minimum stay applies on long weekend holidays. "Highly recommended. The house and location is fantastic, we really enjoyed our stay. Not only is it a fabulous house with everything you could possibly need, but the back garden was a great place for the kids. We will definitely be back." * 50% deposit is required on confirmation of booking. * Balance of rent owing payable 14 days prior to commencement of stay. * Full payment required for bookings less than 14 days in advance of stay. * Bond payable: $500 by bank deposit or electronic funds transfer. Full bond refunded by electronic funds transfer within 2 business days after checkout upon confirmation that all is well at the property after your stay. * All payments and bond by bank deposit or electronic funds transfer. * If there are no back-to-back bookings on the day you arrive or leave we are normally happy to extend these times. Felt so comfortable staying here. Everything was so clean and the little notes around the house was very helpful! Glad you had a great stay at Mansfield House and enjoyed all it has to offer. Look forward to having you stay again. This is a lovely house with plenty of room, comfy beds, and great fireplace to keep warm on a cold winter's night. The house was clean and well stocked to cater for all our needs and Mark was a great host. We enjoyed our short weekend stay and would recommend to others. Glad you had a great stay at Mansfield House, found the house comfy and made good use of the wood heater. we look forward to hearing from you again. We stayed for Christmas week and found the house cosy, comfortable and just as described in the website. It was very clean with plenty of towels, comfy beds and good kitchen equipment. The town was great, as were the local vineyards! The back garden was a great place to relax and watch the cockatoos in the fruit trees. Peaceful and friendly, definitely recommended. We stay with a family friend during winter time and found that property was spacious, comfy, and full of characters. We stayed with a moderatly sized group. Accom was great, plenty of space and everything we needed to allow us to be self sufficient for the weekend.